September saw a rise in new residential listings, with a total of 472 new residential listings in 2018-a 3.5% increase from September 2017. New single family listings were up 8.9% compared to September 2017. 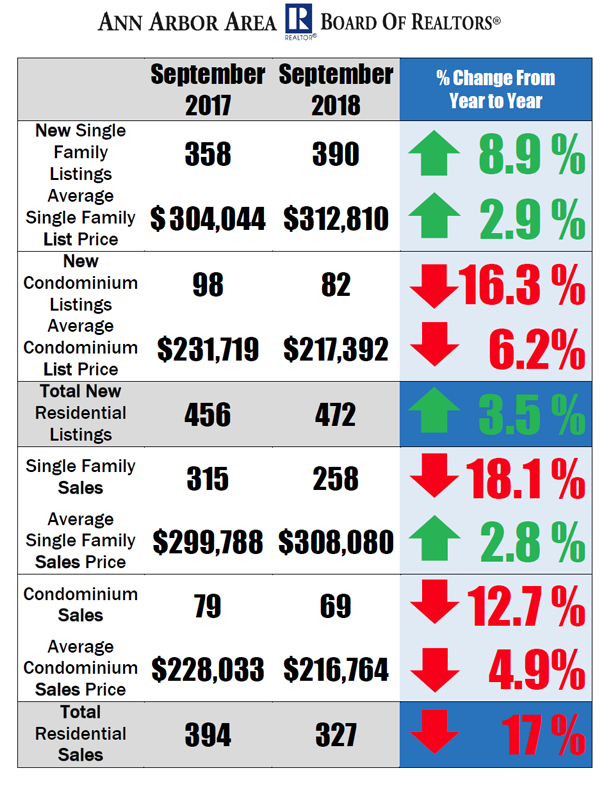 New condominium listings dropped 16.3% in September 2018, a difference of 16 fewer listings than September 2017. The average list price for single family homes rose 2.9%, with an average price of $312,392 in September 2018, compared to an average of $304,044 in September 2017. The average list price for condominiums dipped 6.2% in September 2018, with an average list price of $217,392, compared to an average of $231,719 in September 2017. There were fewer residential sales in September 2018 overall. Single family home sales dropped 18.1% in September 2018, and condominium sales dropped 12.7% in September 2018. Despite there being fewer residential sales in September 2018 compared to September 2017, the average condominium sales price dropped 4.9%, with an average sales price of $216,764 in September 2108 compared to an average of $228,033 in September 2017. However, sales prices for single family homes continued to rise, with an average price of $308,080, an increase of 2.8% compared to September 2017. Single family homes continue to sell faster, with an average of just 25 days on market, compared to an average of 32 days on market in September 2017. Condominiums are selling at an average of 22 days on market, compared to 30 days on average in September 2017. To see more Ann Arbor Area housing statistics, view the September 2018 Housing Statistics Report.